Our Sacha Inchi (Plukenetia voubilis, sometimes also called Inca Inchi) is grown with a focus on the positive impact that it has on the communities and on the environment from which it comes. This is about regenerative agriculture, reversing the devastating effects that cattle ranching has had on vast stretches of deforest Amazonian land, that has left the soils severely degraded. The idea is to naturally revive these areas to become productive once more and returned to natural forest systems that are managed as a food forest and habitat for wildlife. In this project, started in 2009 and now covering an area of 60 ha, much work has been done to replant native species including fruiting trees and medicinal plans that can be used by the locals, along with the sacha inchi used as a commercial crop providing a sustainable means of income for a local co-operative that farm, harvest and process the sacha inchi seeds for export. The hope is to expand this project to regenerate new areas of land into these managed and productive forests using the techniques of permacultivation and polyfarming. Pods containing the sacha inchi seeds are harvested throughout the year by a team currently comprising 40 locals. Once harvested, they are sun dried and de-husked to recover the dark brown seeds. These seeds are toasted whole to produce a delicious snack, or cold pressed to collect the omega 3 rich oil and to produce a high protein meal, which is then toasted in a rotary oven (a necessary step as the raw seed is inedible), milled, sieved and packed ready for export around the world, where like the Peruvian communities, many people are enjoying the nutritional benefits and mild nutty flavor of this wonderful Peruvian Superfood. Sacha Inchi (Plumenetia voubilis) has been cultivated by local communities in Peru for many centuries, with evidence of this being an important food source dating right back to the time of the Inca tribes. Due to its high protein and Omega 3 fatty acid content it is now being widely sought after as a newly emerging superfood. Sacha inchi is increasingly being recognised as an important source of high quality protein since it contains all of the essential amino acids (EAAs) in well balanced proportions. This is unusual since often a mix of protein sources are required to provide the full compliment of EAAs (i.e. lycine is usually missing from grains but is present in legumes which is why rice protein is usually combined with pea protein to achieve the complete set of EAAs). 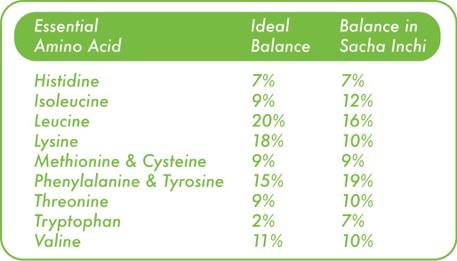 The below shows the ideal balance of EAAs according the established RDIs and the balance provided by the proteins in Sacha Inchi. The highly digestible protein found in Sacha Inchi combined with the omega essential fatty acids, fibers, vitamins and minerals set Sacha Inchi apart from other sources of proteins. The regenerative farming and toxic free environment from which Sachi Inchi comes are the icing on the cake! In addition to the EAAs, Sacha Inchi contains many of the non-essential amino acids that also play an important role. For example, glutamine is very important for healing and it is for this reason that it is sought after by body builders who need to repair muscle after exercise. Of all of the amino acids present in Sacha Inchi, glutamine is found in the highest concentrations, at 133mg per g of protein. The bioavailability of proteins is measured on a scale called the Protein Digestibility Corrected Amino Acid Score (PDCAAS) with 1.0 being the highest score. Sacha Inchi scores 0.9 on this scale, coming well above pea (0.73) and rice (0.47). The fact that Sacha Inchi has such a good content of fats along side its protein also helps, since the presence of lipids improves the bioavailability of the protein. Sacha Inchi provides one of the few vegetal sources of Omega-3 in high concentrations, with around 50% of its fat content being comprised by the Omega-3 fatty acid ALA. Sacha Inchi Oil is therefore a great source of this heart-healthy fat, as is the powder with 20% fat. Fat soluble vitamins A and E, both present in Sacha Inchi, along with the high concentrations of magnesium and phosphorous round off Sacha Inchi’s impressive nutritional profile. Because of how and where it is grown, Sacha Inchi has less heavy metals than is often found in organic rice and soy proteins. Cattle and soy are the main drivers of deforestation in the Amazon, so unlike many whey and soy protein sources, Sacha Inchi is actually helping to reverse this damage. Please contact us if you are interested in wholesale bulk supply of our Organic Sacha Inchi Protein Powders, Oils or Seed Snacks. Superfood Ingredients’ Sacha Inchi products are the result of an innovative green-roots project established in the Peruvian Amazon. The partnering local communities, who work as a co-operative to grow the Sacha Inchi, are employing permacultivation techniques to regenerate areas of devastated Amazonian land so that these can eventually be returned to forest.